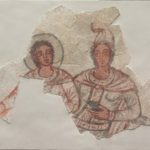 As the Romans and the Parthians clashed in the Middle East, a group of cities struggled to define themselves, as the rich record of their art reveals. In ancient and modern times alike, the Middle East has been a battleground for conflicts between world powers. During the Cold War, the U.S. and the Soviet Union faced off there in proxy wars. Earlier in the modern era, Britain, France, Russia, and the Ottoman Empire contested control. In the medieval period, Islamic dynasties clashed with each other, with the Byzantines, and with the Crusaders. And from the 1st century B.C. 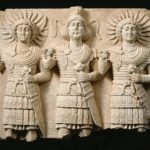 through the 3rd century A.D., the Roman and Parthian Empires, based in Italy and Iran, respectively, struggled for dominance in an area encompassed today by Israel, Lebanon, Syria, and Jordan. 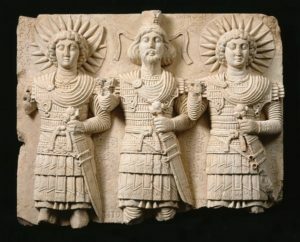 That period of time is the subject of a current exhibition at the Metropolitan Museum of Art in New York, called “The World between Empires: Art and Identity in the Ancient Middle East” (through June 23), which highlights the artistic achievements of a group of communities caught in the middle of these geopolitical conflicts. Subject not only to political and economic pressures but also to diverse cultural and religious influences coming from multiple directions, these city-states—including Petra, Baalbek, Palmyra, Hatra, and Dura-Europos—had a strong need to define themselves culturally. The exhibition, made possible by Dorothy and Lewis B. Cullman and organized by Research Associate Blair Fowlkes-Childs and Assistant Curator Michael Seymour, both of the Met’s Department of Ancient Near Eastern Art, brings together a huge assortment of excavated objects—stone and bronze sculpture, wall paintings, and jewelry, and other artworks and artifacts—to create a multifaceted picture of this pivotal time and place in antiquity. In addition to the Met’s holdings, many pieces have been loaned from institutional and private collections in the U.S., the U.K., Europe, Israel, Jordan, and Lebanon. Trade routes, which spanned empires and promoted an ancient form of globalism, were also routes for cultural transmission, as the exhibition and its copious catalogue make clear. The area in question was a crossroads where the trans-Asiatic Silk Road, which was in its formative stages at the time, met up with the incense routes from the southern Arabian Peninsula, source of the fabled frankincense and myrrh of the Three Kings. Laden with such treasures, camel caravans plodded across the desert to Petra in present-day Jordan, then the capital of the Nabataean kingdom—the “rose-red city half as old as time” celebrated in the 1845 poem by John William Burgon. From Petra, the trade routes ran west to the Mediterranean Sea and north to Judaea and Phoenicia; to the east, across the Syrian desert, they extended to the oasis city of Palmyra, which was a link to Mesopotamia, Iran, and China. The Met’s exhibition is like a history of ancient art, religion, and culture in 190 objects, each one of which tells a story. 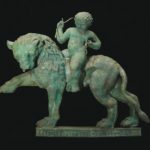 Taking up trail at its beginning in South Arabia (modern-day Yemen), the curators present us with a two-foot-tall bronze relief figure of the child Dionysos riding on a lion, excavated from a layer of ash and debris at the archaeological site of Timna. 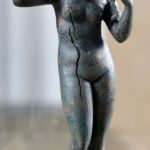 The casting method shows that the object, dated between the early 1st century B.C. and the mid-1st century A.D., was made in South Arabia, and the inscriptions on it are in an early form of Arabic; nonetheless, the iconography and style are Hellenistic. Foreign craftsmen—possibly from Alexandria, Egypt, a major center of Greek culture at the time—may have had a hand in its manufacture, but the inscriptions make it clear that the sculpture had local use and relevance, and that shows clearly just how far Greek culture, including religion and art, had spread by this time and that it truly was multinational. Also from South Arabia is an alabaster incense burner with a relief carving of a man riding a camel, from the 3rd century. On loan from the British Museum in London, it was acquired by Harry St. John Philby—the English explorer and father of the Soviet spy Kim Philby—in 1936 at the site of Shabwa, the ancient capital of the region of Hadhramawt. The frankincense connection becomes explicit here; the object, which has stark, almost modernist lines, would have been used to burn frankincense, and the precious substance itself, made from the sap of a wild rather than a cultivated tree, was gathered in the Shabwa area. As Shabwa became wealthier from the trade in frankincense, which went all over the world, its businessmen began to send expeditions as far as 400 miles away to bring back more. From Judaea comes a particularly remarkable object, called the Magdala Stone, named for the town where Mary Magdalen is supposed to have come from. Excavated in 1999 from the site of a 1st-century synagogue that was uncovered when ground was broken for a Catholic retreat center, it depicts a seven-branched menorah flanked by amphorae that would have carried olive oil. Below the menorah is a square object that may represent the altar of the Temple in Jerusalem, which was destroyed during the Jewish revolt against Rome in 70 A.D. The function of the stone, which is shaped like a chest with four feet, is unknown, but it may have served as the base of a podium for the reading of the Torah scroll or the base for a chest that held Torah scrolls. The city of Tyre in modern-day Lebanon was renowned for its production of purple dye, another coveted luxury product that traveled worldwide. Cedar wood and glass and metal wares were also important exports from ancient Lebanon. Among the objects from the region included in the Met’s exhibition is a bronze ship model dedicated as a votive to a local version of the Greek god Zeus, called Zeus Baithmares. The donor, a man named Kerdon, son of Diodoros, may have been involved in the maritime trading business, thus the concept for the votive object. Designed to be suspended from a chain, the ship model was eventually converted to a lamp. From Tartus, Syria, near the major city of Heliopolis-Baalbek, comes a bronze statuette of Jupiter-Heliopolitanus, a hybrid god who combined traits of the Greco-Roman god Jupiter (Zeus) with various Middle Eastern storm gods. This eclecticism testifies, once again, to the inclusive, international aspect of religion at this crossroads of civilizations, where trade brought people into contact not only with goods from afar but with new religious ideas and symbols. Made in the 2nd or 3rd century A.D., the figure of Jupiter-Heliopolitanus incorporates small figures of the seven planets, which correspond to days of the week—the sun, the moon, Mars, Mercury, Venus, Saturn, and Jupiter—as well as the gods Neptune, Ceres, Minerva, and Diana and the hero Hercules. A much more naturalistic example of the art of the sculptor comes from Palmyra, Syria—a limestone portrait of a woman named Bat’a, from the 2nd–3rd century A.D. Bearing an inscription that says it was made during her life, the sculpture gives individuality and life to the features, while also emphasizing her jewelry by highlighting her necklaces, bracelets, diadem, and brooch in red and yellow pigments. Her eyes are also enhanced with pigment, black in this case, which lends a greater sense of realism. An actual necklace with ties to the same region is in the exhibition. Found in a necropolis in Rome that belonged to an expat community with ties to Palmyra, it is made of gold and emeralds and bears a pendant in the shape of the crescent moon, called a lunula, which probably had a protective purpose. Dura-Europos was a city with a particularly in-between status, having belonged to both the the Parthian and Roman Empires. 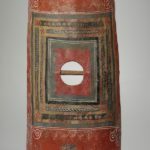 A very striking painted shield from Dura-Europos (mid-3rd century) is a highlight of the exhibition. Made of wood and rawhide, it is painted a rich red with white, green, and yellow decorations and figures of winged victories bearing laurel wreaths and ribbons and flying toward an eagle that grasps an orb of the world in its talons. It was found in 13 pieces in a tower than collapsed during an attack by the Sasanian Persian armies in the year 256. Similar shields were used by Roman legionaries, but figuring out who used this one is made difficult by the fact that it is, at present, unique in the archaeological record. Also from Dura-Europos comes an example of the ancient art of painting, a wall painting of the gods Mithras and Sol (the Sun) dated to the year 210. While fragmentary, it preserves the faces and upper bodies of both figures, showing that they are wearing Parthian-style tunics and cloaks. In the case of Mithras, this is intended to show his Iranian background, although in fact the Mithraic cult as practiced in Dura-Europos originated in Rome. This painting is part of a standard cycle in which the gods banquet together to celebrate Sol’s submission to Mithras, who is depicted holding a rhyton or drinking vessel. 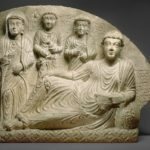 The Met’s exhibition comes at a time when the region “between empires” is once again beset by globally significant conflicts—in Syria, Iraq, and Yemen—that endanger the archaeological record. The recent vandalism and looting that have been perpetrated as part of the wars have affected some of the very sites covered in the exhibition, such as Dura-Europos and Palmyra. Viewing these objects and learning in detail about the circumstances of their making, the cultural traditions they enshrine, and the geopolitical meanings they can yield can only heighten our sense of urgency with regard to the protection of what remains to us from the ancient Middle East.